Some years ago, having a hand-held TV was a craze but it was fairly short lived. The signal, based on the analogue TV signal of the time, was usually very poor and looking at the grainy picture on a tiny screen on a fairly bulky box just didn’t catch on. 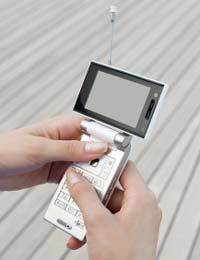 In 2009, the hand-held TV may find a new form as watching TV programs on mobile phones is expected to increase as the BBC puts major investment and effort into making programs such as Dr Who and Eastenders available for mobile applications such as the iplayer. This is now possible because of the expansion to the 3G networks, which can carry video streamed signals. Because of the high quality digital signal, the pictures that appear on your mobile are crystal clear and in full colour. The development has also been helped along by the move to produce mobile phones with proportionally larger screens and more robust processing units. Estimates say that about 25% of us now use our mobiles to surf the Internet using 3G networks, but that 25% tend to be younger people who are often out and who are not solvent enough to own laptops. Their mobile phone is their only means of accessing TV and video content that can be downloaded. Understandably, the BBC is keen to reach this market and says that there will be more phones and services offering services suitable for capturing video. Like the player that is available for PCs and laptops, the iPlayer software for mobiles captures programs at any time within 7 days of their broadcast. Downloads can be made on demand and are completely free. The usage is relatively limited at the start of 2009 with a service available for Apple Devices that connect to wireless networks either at wi-fi hotspots or at home. BskyB is the company that makes most use of mobile video at the moment as it produces live coverage of sports and news that it then feeds to customers who subscribe. Around 300 000 people have signed up to the service so that they can watch videos of football goals from key matches, for example. 2009 will be the first year that the service offers programs that can be watched as streaming video material, or downloaded to play later. Will People Use Mobile TV? Companies are investing heavily into the software and systems and many experts think that the network coverage and speeds have reached the level where mobile TV will really become very popular. Surveys have shown that at least 3 million adults are interested in the concept, with more men and young people having already made use of mobile TV. Many people will find it useful to catch up on news when travelling home from work on the tube or train or bus, and for watching programs in bad, another survey reported. Will Mobile TV Mean the End of Licensing? Currently, anyone who owns a TV has to have a licence to have the equipment to receive programs at their address. When you buy a TV or DVD player or some other piece of equipment that can be used to view TV programs, the shop sends your details onto the TV licensing centre in the UK. You then get a reminder to get a licence, or you have to confirm that you already have one. Some people have assumed that watching TV on a mobile means that you don’t need a licence but, technically, this is not true. You should have a licence for a mobile phone that is used as a TV some of the time. However, it is difficult to see how this rule could be enforced. At the moment, retailers are not obliged to send the details of everyone who buys a mobile phone to the licensing authorities and mobiles do not have to be licensed to a particular address. With so many people changing their mobiles at least once a year, this would be very problematic to administer. The good news is that if your address currently has a TV licence, anyone in that house is also covered for the licence – but the place where you watch TV on your mobile could matter. The law is far less clear on whether your home TV licence covers you for watching TV at a friend’s house if they don’t have either a TV or a licence. Touch Screen Mobile Phones - How Do They Work? Can Mobile Phones Really Multitask?